Rated #1 in the Zagat Restaurant Guide, enjoy an evening of memorable dining at The Mariposa. 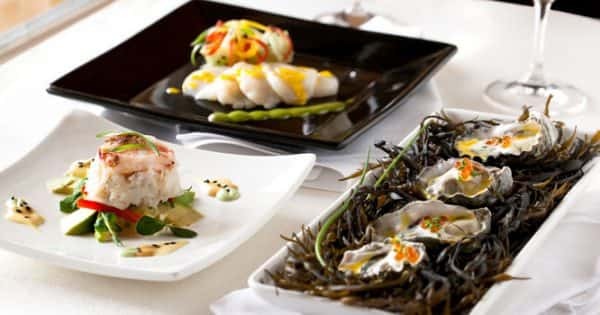 Deer Valley's premier dining establishment offers a blend of classic and current cuisine, as well as tasting menus which include our Mariposa and vegetarian specialties. The wine list has consistently received the Wine Spectator Award of Excellence. The Mariposa recently won Best Restaurant in Mountain Living's Best of the High Country issue. Rated the #1 restaurant in Utah in the Zagat Restaurant Guide, The Mariposa’s intimate setting including crackling fireplaces sets the mood for an extraordinary dinner at Deer Valley’s premier dining establishment. Savor The Mariposa's tasting menu, dining the way chefs love to, exploring and tasting as many of the offerings as you desire. Each menu item is a tasting size portion, allowing you to enjoy multiple selections. Four courses are suggested plus a dessert, but the choice is yours. Should you desire a more traditional à la carte dinner of heartier portions and fewer courses, every item may be scaled up, doubled or tripled in size. Vegetarian specialties and gluten-free options are available. To complement your meal, pair wines from our list which consistently receives the Wine Spectator Award of Excellence. Wine pairings are suggested below and may be ordered as three ounce tastings or five ounce wines by the glass. For larger groups, the Cedar Room accommodates private parties of 13 or more and features The Mariposa menu. Free underground evening parking is available for guests of The Mariposa.